A Developer of Golf in Australia. Barry Leithhead’s collation of information on Anderson’s contribution to the history of Australian golf. GOLF IN AUSTRALIA was founded by people from ‘the old country’ who brought it here, with ancient implements and the desire to find suitable ground on which to play. That foundation was developed by others who followed – men like Peter Corsar Anderson. St Andrews, where he played often and well, holding for half a season the course record of 80, which was four under bogey. His golf was so good that in 1893 when only 22, he won the British Amateur Championship at Prestwick, beating JE Laidlay in the final. However, he was in poor health with pleurisy and hoped for a better climate in Australia. Arriving in Albany, then the major port in Western Australia, he met his elder brother Mark who was a shipping agent there and also a fine golfer. Albany is some 360kms south from Perth, where the Antarctic wind first assaults the golf course. 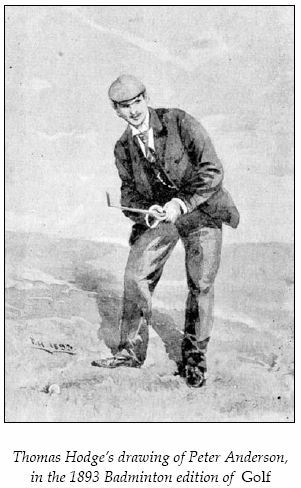 Mark suggested Peter settle in Melbourne, where he had been Champion of the Melbourne Golf Club in 1893. Peter did not delay and within a short time had taken up a tutoring position with a well-to-do farming family at Mansfield, 90kms north east of Melbourne. Six months later he was appointed a master at Geelong Grammar School (GGS) and became a member of Geelong Golf Club (GGC). If his golfing results are an indicator, Peter regained his health quickly. Within a year he had set the course record of 79 for GGC and he reduced it to 76 in 1898 and 75 in 1899, a record that stood until 1904 when his brother Mark reduced it by a single stroke. Peter won the first Championship held at GGC in 1898 and was Champion for six successive years until 19031. Not surprisingly, Geelong won the Victorian State Pennants Championship from 1899-1901 and tied with Royal Melbourne GC in 1902. It is reported that in 1904 Peter Anderson won a pennant match 16 up! The Riversdale Cup was an important event and he won that in 1898-9 and 1902. Mark had won that Cup in 1896, its first year. Consider the clubs Peter played with, bought from Tom Morris, paying 2/- for a head and 1/6 for a hickory shaft from America. His most expensive club was a brassie which cost 5/6. He won the Amateur Championship of 1893 at Prestwick with six clubs: a brassie, a mid-iron, a cleek (for long approaches), a mashie, a niblick, and a wooden putter he also used for the short game. As a reserve, he had a driver, which he did not use. At Geelong GC is it said he used only four clubs; driver, cleek, mashie and putter and rarely carried a bag for his clubs. Peter might not have contested the 1904 Geelong GC championship, having moved to Perth, and it was won by his brother Mark – the first of his three championships at Geelong (also 1907 and 1912). He was made a life member of GGC in 1917. Mark also won the Royal Melbourne Championship five times, the first time in 1893 (Easter – the event was played twice a year in 1893 and 1894) and then in 1894 (twice), 1895 and 18968. There’s a nice quote in the RMGC history from RAA Balfour-Melville, who won an Australian Amateur title but could never beat him in a club event – ML Anderson always seemed to sink a long putt on the 18th!! Mark was runner-up in the 1905 Australian Amateur Championship at Royal Melbourne. In the twelve years between 1903 and 1914, Royal Melbourne won the State Pennant Championship nine times. 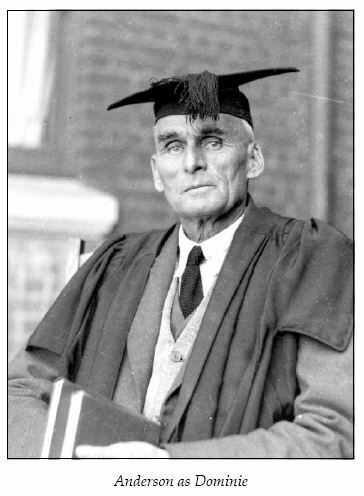 In 1904, PC Anderson became Headmaster at Scotch College Perth, Western Australia, where the first four years must have been an all-absorbing challenge for Anderson, the educator. He was intent on developing the learning of students despite the school’s being in such a bad state on his arrival that the governors were thinking of closing it down9. Westward towards the coastal sand dunes, a rough gravel track struggled up the hill from Cottesloe Railway Station and lost itself in the scrub at Broome Street. It was early June 1908, and the group of men who trudged up the naturally vegetated hill, battled against a driving westerly wind to the coastline. Among them were FD North, one of the earliest residents of Cottesloe, J M Drummond, T Robertson and PC Anderson of Scotch College. Their common interests were a desire to play golf and to construct their own links. One, Anderson, thought wistfully of his native Scottish links, of his succession of triumphs that had carried him to the very pinnacle of golf as British Amateur Champion. What a contrast between Scotland and this almost inhospitable Australian coastline. Yet, beneath the drab scrub and sandhills of Cottesloe, Anderson could see the possibilities of first-class greens, tees and fairways. It was worth a try. A few nights later, on the 11th of June 1908, before a log fire in the local Albion Hotel Commercial Room, sixteen men met and agreed to form the Cottesloe Golf Club12 13. This was the origin of the Cottesloe Golf Club in 1908 and Anderson, along with NC Fowlie designed the course aptly named and still known as ‘Sea View’. The opening of the nine-hole course by the State Governor on 11th September 1909 was only fifteen months after the initial committee meeting. A year or so before, Anderson laid out the first nine holes of the Royal Fremantle course, a few miles south from Perth. In the first two years Anderson won major events at the Sea View course, was appointed Captain in 1912 and one of the Club’s delegates to the Western Australian Golf Association in 1913. Fowlie set the initial course record, bettered by Anderson in 1913 (77) and again in 1914 (75). Fowlie was State Amateur Champion in 1914. Anderson won the Club Championship twice (1917, 1919) when his handicap was +4 and his age almost 50.
which he laid on the counter. The change however, was picked up and pocketed by Anderson, a costly but subtle reprimand for the young players. Forbes would later win the Club Championship ten times between 1921 and 193814. Another story told of PC Anderson arose from the activities of a few boys from Scotch who developed a practice of trespassing on the course on Saturday mornings. When the chairman of Greens Committee asked ‘the Boss’ to exercise more control over his pupils, he received the reply: ‘I look after the little beggars five days a week – someone else can worry about them in the weekend’. There was evident dissatisfaction with this original design because the club engaged Alex Russell only a few years later (1934), to redesign the course completely. Russell’s routing, totally different from the original, embodied the then traditional single loop of eighteen holes – nine holes out and nine holes back, like so many famous courses, such as St Andrews. This Russell routing has largely survived today and surely it would have been more to Anderson’s liking. The Sea View course is still in play, bare of trees, on ground that slopes down to the sea. PC Anderson’s brother, Mark returned to Albany, Western Australia, around 1913. He stayed there, apparently, for the remainder of his life, was Albany Golf Club President in 1922-23 and father of Bill and Jean who were dominant Albany golfers and golf club administrators of the next generation. It is not known from club records whether Mark won any Albany Club Championships (which would seem likely) but he quite obviously became the ’grand old man‘ of the Albany GC. 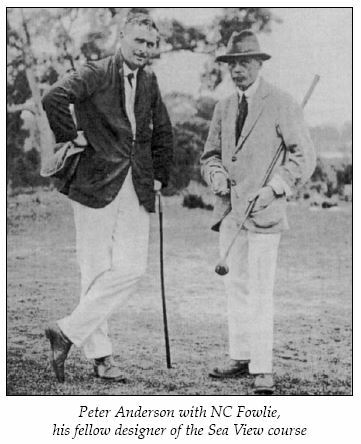 Presumably the Anderson brotherhood started the long close relationship between the Albany and Cottesloe golf clubs which, if not as strong today as once it was, still involves annual club visits. 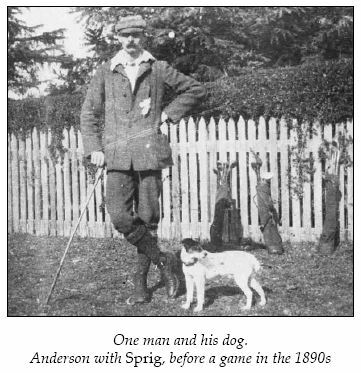 Old Mr Anderson was a dour Scot, like my father’s father, given to playing golf in silence. Mr Anderson had two remarkable shots from very difficult lies, and each time Dad asked him how he did it and each time Mark explained, and apart from that did not speak at all. At the end of the round Dad thanked Mr Anderson very much and the reply was ‘that’s all right, you’re a nice lad but you talk too much!’ . After WWI, PC Anderson seems to have been largely absent from the formal CGC administration. However, he continued to play regularly and was a delegate to the WAGA. It is likely that his perpetual vice-presidency was a largely ceremonial father figure role, a continuation of the ’grand old man‘, the legendary British Amateur Champion of long ago. As such, he gave the CGC a much increased status and aura of credibility. Club members really looked up to him with awe and respect as a figure of considerable stature. Of course, this was assisted by so many of his Scotch College pupils and masters becoming members of the club. There is a huge Scotch old boy contribution to the club to this day. CGC’s History 1893-1983 was compiled by Geoff Newman, a Scotch pupil who later taught under PC Anderson and eventually became the school’s Deputy Headmaster. Anderson was headmaster of Scotch for 41 years, retiring in 1945. During this period annual enrolments rose from 59 to 410; more than 3,000 boys passed through Scotch in his time. The first decade of his regime was marked by the provision of science laboratories, a cadet corps, sports grounds and a boatshed. By 1914 Scotch was established as one of the four leading independent boys’ schools in Western Australia, and for the next 30 years Anderson was doyen among the Protestant headmasters, setting an educational model whose influence extended well beyond his own college. He was a masterful administrator, careful in times of financial stringency but insistent on bold planning whenever opportunity permitted. Impressively built and inclined to be set in his opinions, he earned the nickname ‘Boss’, but was respected for his scrupulous fair-mindedness and capacity for hard work. Legends generated around him, such as the yarn that he once caned the entire school in an attempt to put down smoking. He was awarded the CBE in 194717. Peter Anderson’s great passions for education and golf were played out in three distant arenas – St Andrews in Scotland, and Geelong and Perth in east- and west Australia. Not only was Peter Anderson’s passion for each at a high level but his persistence and determination through difficult times of world wars and the Great Depression were a significant testimony to his character, as was the quality of his golf. The history of golf in Australia is both how the golf was transplanted to Australia and the development of golf once there. Peter Anderson stands tall in both these dimensions of our history. The heritage of golf he brought to Australia, in how he played the game, the clubs he used and his understanding of the game and the course on which it is played, came from the foundation of golf, at the Old Course, St Andrews. When we think of people like Peter Corsar Anderson, we recognise and respect the people who were the founders and developers of golf in this country, on whose shoulders were the burdens of building courses and clubs and the standards of play, and whose passion was encouraging young golfers to play the game well, in its true spirit. These are the shoulders on which we modern Anderson as Dominie Australian golfers stand. Such is the history of golf in Australia. 4 Anderson was from St Andrews but he won the British (not world) championship at Prestwick. 10 Obituary by Professor Geoffrey C Bolton quoting Three Schoolmasters Melbourne Studies in Education 1976, S Murray-Smith Ed. 13 Anderson was one of those who joined the club that night. This article first appeared in the British Golf Collector’s Society publication ‘Through The Green’ in September 2005, and is reproduced here with the kind permission of the author.